During the storms, officials evacuated dozens of guests due to falling trees and downed power lines. More than 200 trees have either fallen or been red tagged since the storm, and tree stumps scatter the park. Morro Bay State Park and its 140 campsites have been closed to visitors since President’s Day weekend. The park has been refunding campers who prepaid for their reservations. State parks officials have also canceled reservations at the Oceano Dunes. Additionally, Pismo State Beach’s North Beach Campground, like Morro Bay State Park, still remains closed. The closure of Morro Bay State Park has affected the neighboring Bayside Cafe. The restaurant remained closed for six days following the storm. Bayside Cafe lost $6,000 worth of food, but recouped the money through insurance. Cafe employees, though, lost out on pay during the closure. Since reopening, Bayside Cafe has not received its typical flow of customers due to the closure of the state park. Currently, workers are clearing roadways, trails and campsites and trying to make Morro Bay State Park safe for visitors, Supervising State Park Peace Officer Robert Colligan said. State parks workers are wracking up extra hours, and Cal Fire and other agencies are assisting with the cleanup. Workers are also making mulch, which may be sold to help recover some of the lost revenue. Morro Bay State Park is scheduled to reopen on March 8. But, park officials are reassessing the time frame daily. 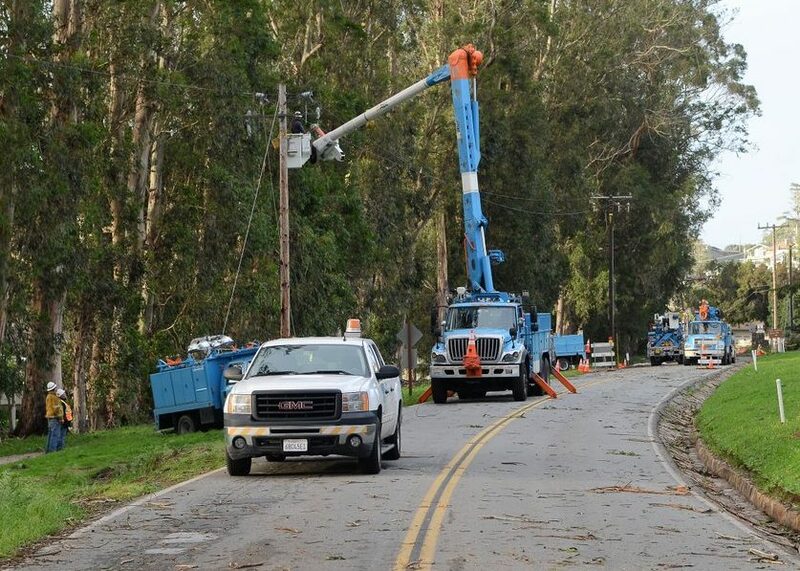 As a child in southern CA, I remember Cal Edison arbor crews going door to door all summer long trimming tree branches away from power and phone lines. No charge to the home owner because Cal Edison knew how important it was to keep the lights on in the cold of winter. Why we don’t see a concerted effort along these lines from PG&E is a mystery to me. Ban storms!! But in all seriousness, I feel bad for no one except the employees of the restaurant. The trees have always been there, storms always come through, tress have always fallen. Sh*t happens. Adapt ND deal with it. The exorbitant fees the state park charges to park your vehicle on a strip of hammered asphalt that you’ve already paid for many times over through taxes is BS. They paid a park ranger to sit in their pickup at the intersection of South Bay and State Park Rd and the golf course Rd. And the State Park Rd. That’s the real crime here. That’s where ‘your’ money went, state park leeches. this is not the first time this has happened. MANY trees were removed following previous storms that did major damage to the park. Unfortunately, the eucalyptus canopy and the Mionterey pines (non native, and susceptible to disease) have been an attractive part of the park…kinda like a forest by the sea. My kids camped there with their class while in middle school several decades ago. Like everything in life is is subject to changes..especially by the forces of mother nature. Not the bit surprised this fiasco happened here. Every look at all the dead pines and the top heavy Eucs? I tend to disagree…had this been Hearst Castle, an armada of state workers would be out making sure a leaf didn’t fall from a tree…..a double standard to say the least. Snivel, snivel, this is what happens when our public benefits have been converted into enterprise funds and public monies have gone into other liabilities like pay and pensions. A river of tears for the Bayside Cafe, but I hold no sadness for the Morro Bay State Park. With its disgusting and often locked closed bathrooms, puddles of water and mud all year, and barely perceptible ownership, that dive should be closed 24/7 simply because it’s an embarrassment. Selling mulch, really?